Leashed pets are always welcome! See reptiles from around the world, as Repticon joins the Super Pet Expo! Purchase reptiles, supplies and learn more about your special pet from experts. For the first year ever, Super Pet Expo will play host to this wonderful Potbellied Pig adoption and placement organization. Learn more about pig care, rescue and take home your very home piggy painting with proceeds going to support the rescue. From beautiful cat dressed as Katy Purrrrry to a gorgeous Great Dane as the ultimate champion Rocky, this competition is serious fun! ​Open to all show attendees, dress your pet up in their best costume and plan to rock the Main Stage. 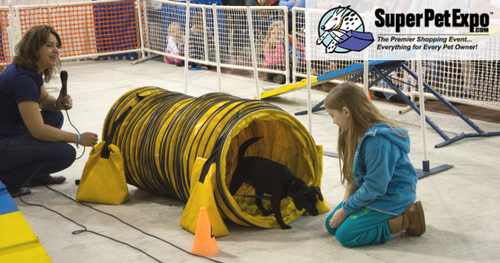 The expansive play space offers a safe environment for dog socialization and exercise right in the middle of the expo.